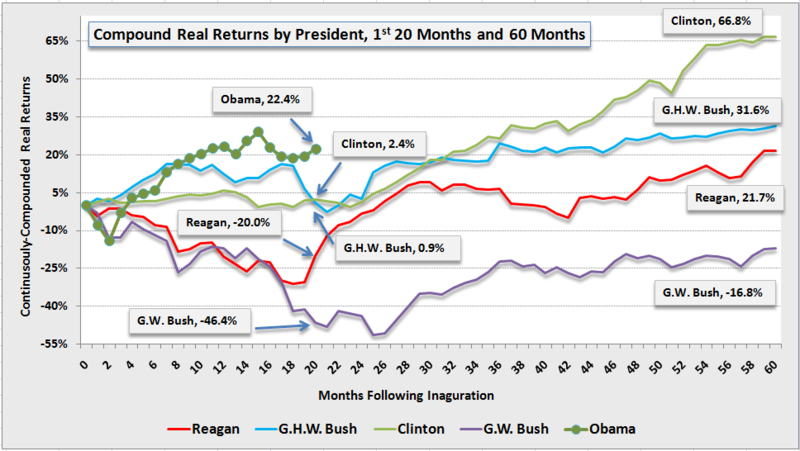 Home > Market Commentary	> Does the Obama Bull Market Have Years to Run? Does the Obama Bull Market Have Years to Run? The theories of Rational Expectations and Market Efficiency are two of the most important economic ideas to emerge from the previous century. Respectively, these ideas hold that a.) at most points in time, the prices of securities and other assets rationally reflect investors’ anticipation of how future events will affect the values of these assets, and b.) as new information becomes available, the relevance and importance of this information is rapidly and accurately reflected in asset prices. When you ask business executives (or politicians) about their preference for government- vs. market-based mechanisms and outcomes, and get a response along the lines of “markets always know best,” their answer reflects how these ideas have been, to a large degree, seamlessly adopted as unquestioned asssumptions that drive many of the opinions we hold and conclusions we reach. 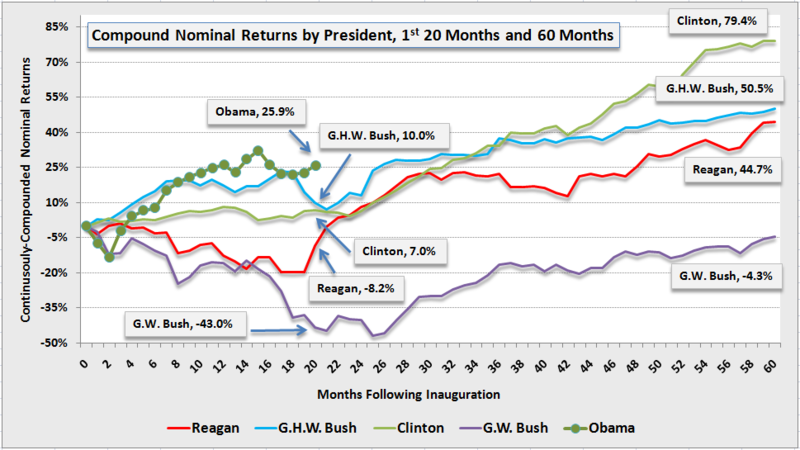 The total returns earned during the first 20 months of the Obama Bull Market (25.9% nominal and 22.4% real) are the highest among the previous 4 presidents — Reagan, GHW Bush, Clinton, and GW Bush. Even more interesting, at the 20-month mark, the stock market had accurately predicted which Presidents would preside over the best — and worst — 5-year performance. The stock market rankings as of month 20 perfectly predict the 60-month performance, using both nominal and real returns. Interpreting the above results using a “markets always know best” framework, one would conclude that a.) markets love Obama’s policies, and b.) the Obama Bull Market has several more years to run. Let’s all remember to theorize responsibly this Thanksgiving. Clever and thought-provoking. Don’t you think the depressed levels of the stock market in the spring of 2009 bias the analysis in favor of Obama?